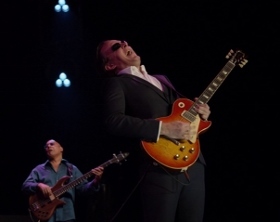 By now, you’ve probably figured out from this blog that nearly everything that blues guitarist Joe Bonamassa puts out is good stuff, and his latest CD/DVD set Live at Radio City Music Hall (J&R Adventures) is certainly no exception. 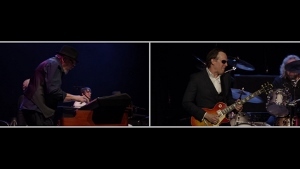 Recorded in January during a sold-out, two-night run, the set captures Bonamassa’s first time playing the famed Radio City Music Hall, fulfilling one of the New York native’s lifelong dreams. 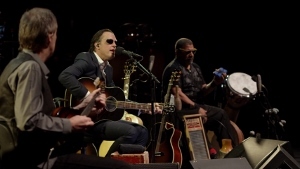 Coming at the conclusion of a lengthy tour made up of shows that were half-acoustic, half-electric, the CD includes tracks from across several of Bonamassa’s recent albums, including blues classics like “Hidden Charms” and “I Can’t Be Satisfied” from his Muddy Wolf project, many of the songs from his latest studio album Different Shades of Blue, and both a few slightly older (“Dust Bowl”, “Happier Times”) and brand new numbers, backed by two different bands, with the one that accompanied him on his An Acoustic Evening at the Vienna Opera House recording (Gerry O’Connor on fiddle, Mats Wester on nyckelharpa and mandola, Reese Wynans on keyboards, and Lenny Castro on percussion) joining him here for the acoustic portion of the show and his regular touring band of bassist Carmine Rojas, keyboardist Wynans, and drummer Tal Bergman playing on the electric tracks, along with Lee Thornburg, Nick Lane, Paulie Cerra on horns. Kicking off with a swinging, horn-filled cover of Muddy Waters’ “I Can’t Be Satisfied”, Bonamassa keeps things moving at a high level with the first of two newly recorded songs, a groovy, spitting “One Less Cross to Bear” containing such lyrical zingers as “I feel for Jesus, and what He went through/ thank God He didn’t have someone like you” and “got a brand new car/ you got the dog too/ I can’t believe there’s ever a day that I loved you/ it ain’t fair, I got one less cross to bear”, followed by the racing “Living on the Moon” and in-your-face “I Gave Up Everything for You, ‘Cept the Blues” off Different Shades of Blue. Keeping things uptempo, the band first hits on Howlin’ Wolf’s “Hidden Charms” and then the funky “Love Ain’t a Love Song” before closing the night with a jazzy take on the soft, powerful, Ray Charles-inspired “So, What Would I Do?”. As we’ve come to expect from such projects from Bonamassa, there are plenty of solos not only from Joe but also from many of the other members of the band(s), and the mixing from Shirley is some of the best you’ll hear, allowing Joe’s guitar and vocals and the keyboards, percussion, and horns all to be heard at the right levels at precisely the right times. The DVD of course includes all of this plus an additional two numbers in the slow, smoking “Double Trouble” and the edgy “Black Lung Heartache”, the latter of which happens to fall – along with the introductions of Joe’s acoustic band – between “Different Shades of Blue” and “Happier Times”, thus eliminating that lull some listeners might find on the CD. The video is sharp and clear, filmed from an interesting variety of angles, and presented here with some neat split-screen effects showing from two to four angles at once, often of the same player. 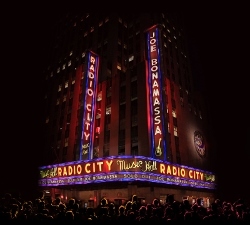 With two new songs and seven other unreleased live tracks (most from Bonamassa’s latest studio album), Live at Radio City Music Hall makes for a nice addition to the collections of both the most casual and most loyal Bonamassa fans. This entry was posted in Albums and tagged Joe Bonamassa, Kevin Shirley, Lenny Castro, Reese Wynans. Bookmark the permalink.